Good evening from Huntington Beach everyone! This is one wedding photographer that has once again been away from the office quite a bit over the past couple of weeks teaching at a couple high schools in Orange County, being a guest speaker at Mira Costa College in San Diego & even though I’m burning the late night energy today, cuz I am the “Energizer Esquire” as I’ve been told – I’m super excited to share with you to the next episode of “How To Make The Most Out Of Your Wedding Day! Every other week “How To Make The Most Out Of Your Wedding Day” is committed to help Brides and Grooms be introduced to some of the best wedding vendors in the industry. We’ll be sharing tips & tricks, along with features & benefits of why hiring professional vendors on your wedding day will not only save you time, but your money & your sanity. For this week’s program episode I am joined with uber cool and Jaegermeister sponsored DJ Neko last fall at the “Grizzly Hotel” (aka; Grand Californian) at Downtown Disney. DJ Neko is a professional DJ from San Diego who I’ve had the honour of working with on many weddings and events and even my sister; Tawnya & Kurt’s Wedding Day that I photographed at the opulent Falkner Winery in Temecula. If you don’t know much about DJ Neko just yet, check out his bio. It’s totally overloaded with his passion for his craft and how much he loves what he does. 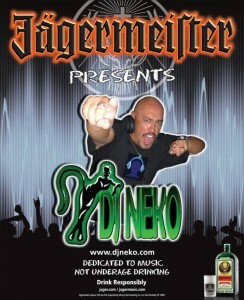 “UP THE ENERGY AT YOUR CLUB, PARTY OR EVENT WITH DJ NEKO! One of Southern California’s premier club DJs, DJ NEKO built his rock-solid house rep spinning, scratching and spontaneously remixing credible electro dance music into incredible energy-jammed sets that club-and party-goers find impossible not to get out of their seats and dance to! How does DJ NEKO do it? Some call his music Electro-Hop, R&B Dance or even Hip House, but to him it’s all about “feelin’ it.” In fact, “Feel It” is the name of his smash club hit that never fails to whip the room into a dancing frenzy. DJ NEKO’s mission is to share the feeling, the love and connection to Dance music that he discovered as early as age 7 with his first drum set, quickly followed by a keyboard and, in his teens, several guitars. “I knew in high school that music would be the driving force in my life.” Listening to his early musical influences — the break dancing bands of Depeche Mode, New Order & Run DMC — NEKO fell in love with the idea of DJing and soon broke into the scene playing tunes for break dancers on the busy tourist streets of San Diego. Before long, DJ NEKO ‘s Colossal Mobile Sound Company was born and much in demand at local private parties, schools, business parties, and clubs. Building on his success in San Diego, DJ NEKO took his unique, energizing electro-house music to Las Vegas, with extended and repeat appearances at The Drink, Shark Club and Utopia nightclubs. As NEKO’s club cred grew, he was given a radio time slot on KLUC 98.5, Las Vegas’s #1 Hit Music Station. Over the years, DJ NEKO’S spot-on mixing and much-in-demand Rockin’ the Bass talents have kept him in mobile demand between San Diego, LA, San Francisco, and Vegas Hotels’ club rooms at the Paris Hotel and Casino, The Hard Rock, and The Rio. When at home in San Diego, DJ NEKO regularly spins the busy Gas Lamp District with his powerhouse mixes at popular venues such as the rooftop Altitude and On Broadway. So sit back with a pad of paper & pen and be ready for some great information on “How To Make The Most Out Of Your Wedding Day” with DJ Neko down in San Diego. PS, I know I’ve mentioned it before, but I really am excited to share with you that the butterfly movement that I’m doing my best to help create in Orange County! it’s such an honour to be more than just a Huntington Beach Wedding Photographer in Orange County capturing beautiful portraits and covering amazing events all over Southern California. But a photographer that wants to help dilate minds and make positive changes in this world! PSS, Because DJ Neko is all that and a bowl of chips & dip – he rocked his episode in one take. So we don’t have any crazy outtakes today, but I’m sure I’ll have some for you in a couple of weeks!